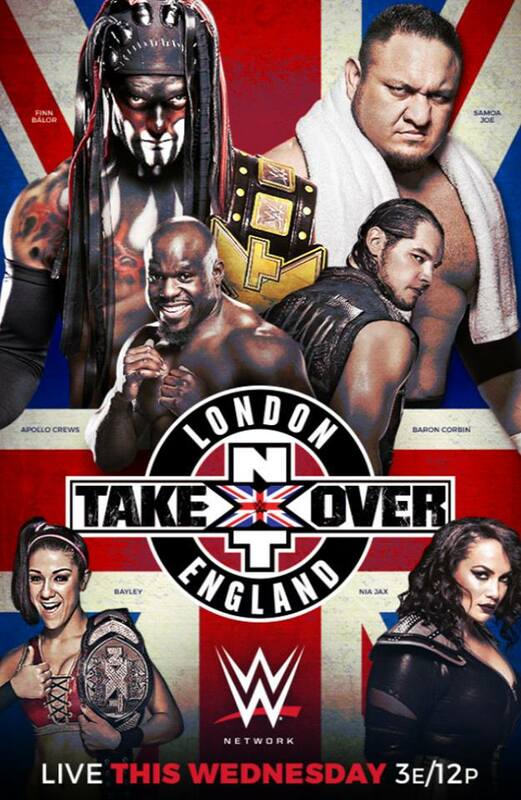 For the first time NXT broadcast a special from across the pond, in front of 10,000 screaming Londonites. This particular show might've been the most well-rounded TakeOver to date, as every match felt like a big deal and multiple newcomers were elevated. The opening contest nearly stole the show, as Japanese sensation Asuka faced NXT stalwart Emma. The wrestling here was incredibly crisp and Emma held her own against Asuka's innovative offense. Late in the match Dana Brooke attempted to interfere multiple times, nearly costing Asuka the bout, first by DQ then by pin. But Asuka outmaneuvered both adversaries to eventually win with the Asuka Lock. Normally I hate overbooked finishes like this, but it was almost as though they teased a RAW-type finish only to deliver the clean submission in the end. Helluva contest. The intensity level stayed high with the Tag Title match, as The Revival faced Enzo & Cass. Much like the previous match I figured the better technical workers would dominate, but Enzo & Cass kept pace with the Champs and the teams delivered a pretty excellent tag match. I've said it before, but The Revival is such a refreshing act, calling to mind the tag teams of the Jim Crockett era. After nearly 15 minutes Dash & Dawson finished Enzo with the lung blower. Undoubtedly the weakest match of the night was in the third spot, but even this wasn't bad at all. Baron Corbin faced Apollo Crews in a middling brawl. I'm still not sold on Corbin's offense, as aside from a couple big moves he mostly relies on generic big man strikes. He seems to not always know what to do next. But this match was fine, just nothing amazing. New monster women's heel Nia Jax got her first big match in the semi-main slot, challenging NXT's new cornerstone Bayley. This match had a very slow pace due to Jax's methodical power style, but it told a great story of Bayley's experience and savvy keeping her one step ahead of her much larger opponent. Late in the match, after taking much punishment, Bayley utilized a guillotine choke as her primary weapon, slowly wearing Jax down until eventually forcing the tapout. Very strong stuff. The main event pitted NXT Champ Finn Balor against former ally Samoa Joe, after the latter turned on him. This was an excellent New Japan-esque match that started tentative and built to a fantastic war of strikes, reversals and finishers. Joe twice attempted the Muscle Buster only for Finn to escape, thus protecting his devastating finisher. After countering a superplex attempt, Finn shoved Joe off the ropes and hit the double stomp to retain. Undoubtedly Joe's best NXT match to date, and arguably the best men's TakeOver main event. The London show was a streamlined five-match show that absolutely flew by and felt like one of the old Clash of the Champions shows where no slots were wasted and almost everything worked like a charm. After losing three of the Four Horsewomen, NXT quickly and amazingly rebuilt the women's division with a mix of experienced and green stars, and after the departure of Kevin Owens, repositioned Finn Balor as the face of the brand. This was probably NXT's best TakeOver special yet. Most Pleasant Surprise: How good Emma is in the ring. I hadn't seen much of her work before this, but she kept up with Asuka beautifully.